How does Sacramento unemployment compare to California and the rest of the country? At the risk of sounding like a geek, I’m really excited about this graph. While the trend feels painful in some senses, it’s interesting to see how Sacramento compares with the state and country. 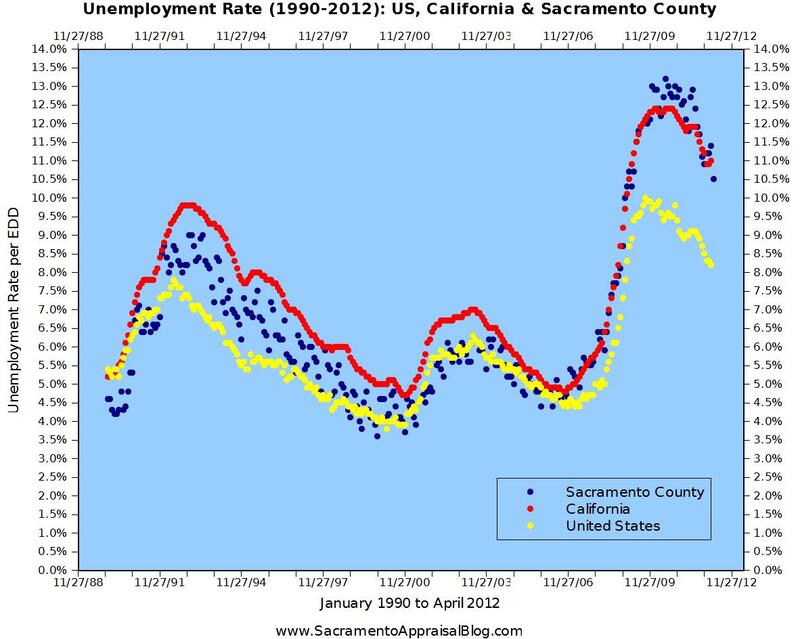 As you can see, while the unemployment rate began to plateau nationally during 2008, Sacramento County and California weren’t finished increasing. If you remember, the latter part of 2008 was not an easy time for Sacramento real estate. That’s when a “wave” of foreclosures flooded the market and really drove prices down. If you don’t remember the wave, check out a previous post that shows ten years of housing inventory as well as a video interview on why inventory is so low right now (only one month of housing supply). Unemployment is simply one of those big metrics to watch, and we need to see a decline over the long haul to really see our housing market improve. After all, it’s hard to imagine a full recovery when unemployment has still been hovering around 11.0% in Sacramento County, right? Click the thumbnail image to view a larger graph (2x the size of the one in this post). If you’d like to use the graph on your blog or website to be a resource to your readers and clients, please do so. Please see my sharing policy for details. It’s a huge honor when others share my content. Thank you to my real estate broker friend Joel Wright who traded some data back and forth with me as I gave him what I had for all of Sacramento County and he gave me what he had for California and the United States. That’s how this graph was born. Data source: EDD. What do you see above? How does this graph strike you? Maybe. Maybe back in the olden days we needed employed people but we’re a global community now. For the past two years, NAR has been talking and teaching about working with foreign investors, and we’ve got digital ink for contracts. Investors are already trying to do bulk purchases of these homes in an REO-to-rental program. NAR is working to stop it from happening. I think we might be selling SFDs to foreign cash investors, who’ll rent them to the low-income/unemployed former middle class who’ll be subsidized by Section8 or other such vouchers or live with 8 people in a 3-bedroom house. Regarding unemployment, buyers still need to be able to afford houses, so the unemployment rate going down will only mean good things for the market. If we can get more jobs and higher pay too, purchasing power will increase. The interesting thing we’re seeing in the market is how much cash there is. There are so many investors competiting to purchase properties. Foreign or not, buyers definitely have to compete with cash buyers looking to capitalize off lower prices. Have you seen many foreign buyers locally? I come across buyers from France sometimes, but most of my clients are dealing with citizens (those are just my clients though).